A savanna is an area of tropical grassland of South America and particularly Africa, lying between equatorial forests and dry deserts. Savannas occur mainly between 5° and 20° north and south of the equator, except in East Africa, where, because the land is elevated, savannah regions are situated on the equator. 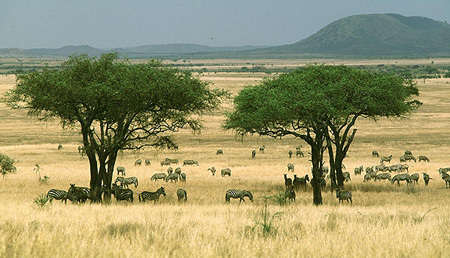 The savanna climate is hot and wet in summer, when the Sun is overhead; temperatures average about 25°C (77°) and the rainfall is 25 centimeters to 125 centimeters (10–50 inches). In winter, the tropical high-pressure system controls the climate, and so the conditions are warm but very dry. Temperatures are 15°C to 25°C (59°–77°F), and rainfall totals are less than 250 millimeters (10 inches). In such a climate, grass grows very well in summer – up to 2 meters (6 feet) in height – but it will shrivel in winter. Trees do not grow well, although baobabs and bottle tress survive by storing water inside their swollen trunks.